Qatar has one of the highest per capita waste generation rates worldwide. In 2012, Qatar generated 8,000 tons of solid waste daily (excluding construction and demolition waste which amounts to 20,000 tons additional waste per day). This number is predicted to reach 19,000 tons/day in 2032, with an annual growth rate of roughly 4.2%. Most of these wastes end up in landfills – in 2012, more than 90% of Qatar’s solid waste were sent to landfills although the government is intensifying its efforts to reduce this amount. This percentage is extremely high compared to many industrialized countries in Europe and Asia (e.g. Austria, Denmark, Netherlands and Japan) where less than 10% of solid waste are disposed of in landfills. These countries have high recycling rates, have invested in technologies that convert waste into energy, and apply composting process to their organic waste, especially food wastes. In some of these nations, as much as 40% of their wastes are composted. 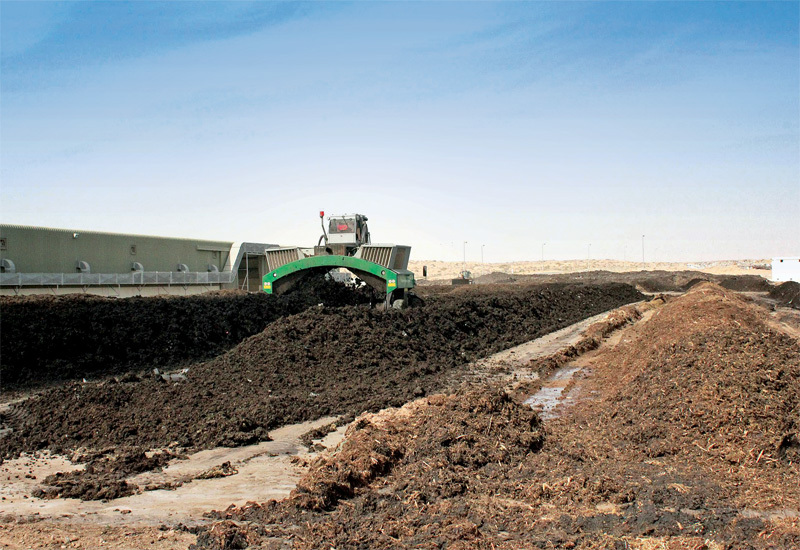 Currently, composting in Qatar is mainly done at the Domestic Solid Waste Management Centre (DSWMC) in Mesaieed, which houses the largest composting facility in the country and one of the largest in the world. The waste that enters the plant initially goes through anaerobic digestion, which produces biogas that can power the facility’s gas engine and generators, followed by aerobic treatment which yields the final product. Two types of compost are generated: Grade A (compost that comes from green waste, such as yard/park trimmings, leftovers from kitchen or catering services, and wastes from markets) and Grade B (compost produced from MSW). The plant started its operation in 2011 and when run at full capacity is able to process 750 tons of waste and produce 52 tons of Grade A compost, 377 tons of Grade B compost, liquid fertilizer which is composed of 51 tons of Grade A compost and 204 tons of Grade B compost, and 129 tons of biogas. This is a significant and commendable development in Qatar’s implementation of its solid waste management plan, which is to reduce, reuse, recycle and recover from waste, and to avoid disposing in landfills as much as possible. However, the large influx of workers to Qatar in the coming years as the country prepares to host the World Cup in 2022 is expected to substantially increase solid waste generation and apart from its investments in facilities like the composting plant and in DSWMC in general, the government may have to tap into the efforts of organizations and communities to implement its waste management strategy. Thankfully, several organizations recognize the importance of composting in waste management and are raising awareness on its benefits. Qatar Green Building Council (QGBC) has been actively promoting composting through its Solid Waste Interest Group. Last year, they were one of the implementers of the Baytna project, the first Passivhaus experiment in the country. This project entails the construction of an energy-efficient villa and a comparative study will be performed as to how the carbon footprint of this structure would compare to a conventional villa. The occupants of the Passivhaus villa will also be made to implement a sustainable waste management system which includes composting of food waste and garden waste, which is meant to lower greenhouse gas emissions compared to landfilling. Qatar Foundation is also currently developing an integrated waste management system for the entire Education City and the Food Services group is pushing for composting to be included as a method to treat food and other organic waste. And many may not know this but composting can be and has been done by individuals in their own backyard and can even be done indoors with the right equipment. Katrin Scholz-Barth, previous president of SustainableQatar, a volunteer-based organization that fosters sustainable culture through awareness, skills and knowledge, is an advocate of composting and has some great resources on how to start and maintain your own composting bin as she has been doing it herself. A simple internet search will also reveal that producing compost at home is a relatively simple process that can be achieved with minimal tools. At present, very few families in Qatar are producing their own compost and Scholz-Barth believes there is much room for improvement. As part of its solid waste management plan as stated in the National Development Strategy for 2011-2016, Qatar aims to maintain domestic waste generation at 1.6 kg per capita per day. This will probably involve encouraging greater recycling and reuse efforts and the reduction of waste from its source. It would also be worthwhile to include programs that will promote and boost composting efforts among institutions, organizations and individuals, encouraging them with the fact that apart from its capability of significant waste diversion from landfills, composting can also be an attractive source of income. Note: The article is being republished with the permission of our collaborative partner EcoMENA. The original article can be viewed at this link. Michelle Rose Rubio holds a Masters degree in Environmental Engineering from the University of the Philippines. She also has a Bachelors degree in Chemical Engineering and has worked on several research projects involving wastewater treatment. As a former freelance writer, she has written numerous reports on various topics related to science and engineering. Previously a university instructor on Mathematics and Chemistry, she is now a full-time environmental volunteer based in Qatar and an advocate of environmental sustainability. Tagged Biogas, Biogas in Qatar, Compost, Composting, Composting in Qatar, Domestic Solid Waste Management Center, Domestic Waste, DSWMC, Fertilizer, Food Waste, Garden Waste, Landfill, Municipal Wastes, organic waste, Qatar, Qatar Foundation, Recycling, Waste Management. Bookmark the permalink. Thanks so much much for this article. Do you see future demand for agricultural compost in Qatar? My organisation is running composting sites with capacities between 60.000 mt – 70.000 mt in countries like Egypt, Ethiopia and South Africa. What would you recommend to enter the market in Qatar? would you please differentiate between A & B grade compost ?